Whenever the stress of school becomes too much to bear, stare at Serena J. Sparkles - the PERRLA Magical Unicorn of Serenity. If you have time, go to that special, happy place in your mind, riding Serena in flowery fields while allowing your paper-writing worries to dissipate. If you've no time to spare, simply rub her horn for good luck. Uses: Temporarily relieves stress associated with student activity. Use only as directed. 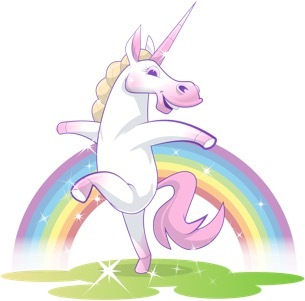 Directions: Stare at unicorn while symptoms persist. Staring at unicorn inadvisable for patients with a history of staring at unicorns. Do not drink alcohol in excess while looking at the unicorn. If you are pregnant or become pregnant, the unicorn will gladly disprove paternity on The Maury Povich Show. If swallowed, immediately seek medical attention and then tell us how you did that. A small number of clinical trial participants developed PUIWAMS* and were advised to taper their dosage. Discontinue use immediately if you begin to believe you are Beyonce. Same goes for Abe Vigoda. Check for ticks after each session to reduce likelyhood of Lyme Disease. Avoid looking at the unicorn if you are taking a monoamine oxidase (MAO) inhibitor until someone explains to us what the heck that is. Use of the unicorn may make you drowsy or cause terrible insomnia or may quickly alternate between the two. In rare cases, New York patients who were asked, 'You want I should get coffee?" spontaneously recited the entire Lord of the Rings Trilogy. If nominated for President, the unicorn will not run. If elected, the unicorn will not serve. Enough said. *PERRLA Unicorn is Winking At Me Syndrome. Q: What's going to happen with the Greek Debt Crisis? A: I'm a unicorn, for goodness sakes! Why aren't we talking about Twizzlers and Rainbow Skittles and Fairies?! Oh, all right... I belive that a European body having more control over the budgets of the member nations will help. A strong fiscal union coupled with the relaxation of austerity measures that have caused so much civil unrest will slowly restore confidence in the Euro. Q: Which is better; crunchy or smooth peanut butter? A: Smooth. But I rarely eat it because it maketh me tawk like thith untiw I can get it off the rooth of my mouth. Q: Why do I have to write so many papers in school? Q: I see that your middle initial is “J.” What is your middle name? A: Jellybean, actually. It's an old family name. Q: Serena, what is the origin of your sparkles? A: Firstly, thanks for noticing the sparkles. A lady loves to hear a compliment! The most important thing is to stay hydrated. Between my Hot Yoga classes and my Kettlebell workout, I’m often quite parched so it’s important to drink plenty of fluids. Exercise is important and, these days, I’m getting a good work out, what with all you paper-procrastinators taking me out for a trot. So, hydration and exercise are key. Without that, one can’t sparkle. But, the true source of the sparkle is optimism. I get up every day thinking that something magical may happen - and it usually does. For instance, you’re reading text from a unicorn! p.s. I’ll confess to using a little Pledge™ on my horn to give it a nice, rich luster! Q: What kind of car should I get? A: I’m not what you’d call a “car person,” really. Some of the boy unicorns around here are into cars, but I don’t want to ask them this question. They get a bit weird whenever I talk to them. I think I intimidate them, really, because my horn is bigger. They’re so silly! Q: Do you know, have you ever dated, or are you related to the Ninja Unicorn that lives under my daughter's bed? If there is a "love child" involved or he is a baby daddy, I don't want to know. A: “Dating”, “Love child” ? Goodness, no! I spend all of my time ferrying ADD writers around the meadow, to and fro. And when I’m not doing that, I’m typing with these clunky hooves – and that’s not easy, believe you me! I barely have time for my Hot Yoga classes, as it is. I suppose if a nice bloke trotted along and chatted me up, I might meet him for tea. Who knows?! Q: What is that distracting thing, growing out of the left side of your upper neck and, will you continue to share your sparkles into the future? A: That thing that you think is growing out of my neck is really just the top of my mane, falling down between my ears and brushed over to the side. I’m not crazy about my stylist, if I can be honest with you. Yes, I will continue to share my sparkle as long as PERRLA will allow. But, it’s not easy finding the time for PERRLA emails. Not only is it physically demanding (try typing with hooves on a tiny, bluetooth keyboard!) but my time is limited, what with all the writers wanting to take a mental break and ride down to the Twizzler’s™ forest!